Malina Hut is located in Dolen Kaluger in Central Pirin. The structure lies at the foot of Boikov Vruh, 5490 ft (1674 m) above sea level. Malina is a large 2-story building. For fans of mountain tourism, it has 68 beds available, distributed into rooms with 2-3 beds each. Prices are about 10-12 leva per bed per night. There is one bathroom per floor. The hut has a humble dining room. There are several spots on the field in front of the hut where visitors can light a fire. There's even a barbecue for enthusiastic chefs. Camping on the hut grounds is also allowed, the fee is 4 leva per night per tent. Heating inside the hut consists of radiator heaters that burn solid fuel. 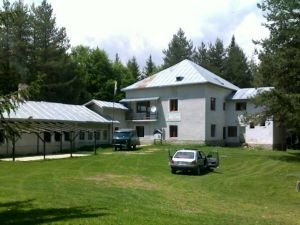 The starting point toward the hut is from Pirin village, Sandanski municipality, where there's a 9 mi (15 km) section of asphalt road. After that there's a dirt road about 2.5 mi (4 km) long which leads to the hut itself. 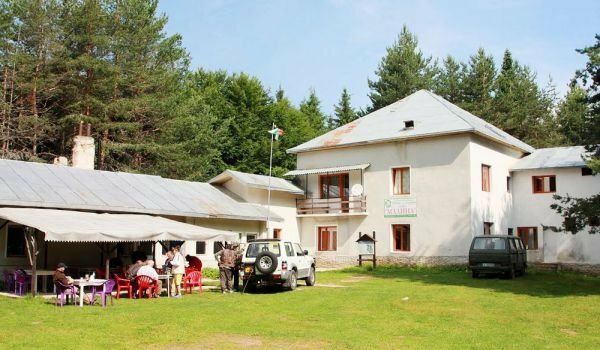 Malina Hut is managed by Edelweiss tourist agency, from the town of Sandanski. It's open from May until the end of October. Several trails from Malina Hut lead to nearby sites. There's a trail leading to Popovi Livadi hut, the hike takes about 6 hours. Pirin hut can be reached after a 2 hour hike. There's also a trail heading to the Todorova Polyana Saddle - 2 hour hike, as well as to Goren Kaluger - 20 min. hike.